Gotham City is standing up to Batman and police brutality, and it's The Joker who's leading the charge. 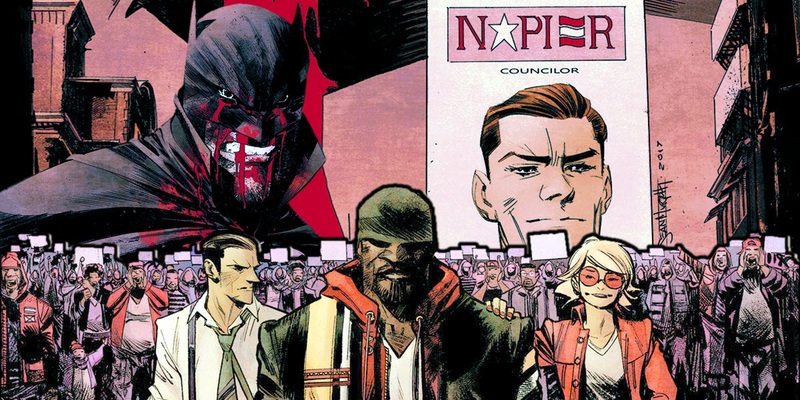 But before fans start accusing DC Comics or Batman: White Knight writer and artist Sean Murphy of 'jumping the shark,' the political protest marches coming to Gotham are anchored in some faithful comic logic - as well as real political unrest. And when the public finds out just how much money it costs to repair the damage caused by Batman in his 'heroic' adventures, it's hard to blame Gotham's 99% for being upset. The White Knight series begins with Joker being cured of his insanity, but Murphy has stopped short of admitting that Jack Napier, as he's really named, has gone completely 'good.' He's still out to bring down Batman, but this time, he's using the corruption of Gotham, the police brutality plaguing the GCPD, and Batman's own extreme tactics as ammunition. And from the looks of it, Issue #4 is going to be dealing with some real-world issues even more directly than White Knight has already. What people might not expect is that it's Batman who's the first to get violent with the protesters. Joker won't just be leading the march with the restored, classic Harley Quinn at his side, but a new vision of Duke Thomas. Thanks to preview pages of Batman: White Knight #4 from WeGotThisCovered, fans can get an early look at the Napier political rally marking his official entry into Gotham politics. Napier is throwing his hat in the ring As the new candidate for the city council seat of Backport, an overlooked, rundown neighborhood Batman recently... remodeled. And when the GCPD show up with hate and anger for Napier on their minds - some pointed directly at Duke Thomas - things go as most now expect. Duke made his debut in Issue #3 of the series, apparently a leading figure in keeping Backport safe. Claiming that the GCPD have left it to its own devices, Duke - who was introduced in 2013 as a young community organizing vigilante - has established a makeshift police force. He has some experience, having joined, then left the force due to his distaste for corruption. Corruption and distaste that takes the form of Detective Harvey Bullock, opposing the public protest on the grounds that... well, the GCPD abandoned Backport in White Knight to help protect Gotham's upper class. Needless to say, the cops know how they're expected to respond. It's still difficult to tell how much Joker truly believes the case he's making: his account of reforming, and being accepted by Backport are legitimate - as is his description of Batman and the GCPD as a problem, not a solution. But when Duke and Harvey come face to face, and both Jack Napier and Jim Gordon try to defuse the situation, Batman arrives to make things much, much, much worse. We don't yet know what follows the ambush attack from Batman, seeking not to maintain order (by removing Bullock or the police opposing a march), but attacking Duke and Jack - the peaceful organizers. It's not surprising to see Barbara Gordon openly questioning Bruce Wayne's decision, since... you know... neither Jack nor Duke have actually done anything besides exercise their civil rights. And as much as some may see the scene as making only a 'political statement,' it's a well-reasoned examination of where Batman fits in a truly modern society. Murphy spoke openly about his contemporary influences and inspirations for White Knight, and what aspects of current America wouldn't be erased for the sake of 'fiction.' This Gotham City is one in which Black Lives Matter is a concern on many minds, and in which police brutality is a bigger problem than usual (no "Gotham cops are dirty" dismissals here). And in a world like that, this one scene hints, can a figure as black-and-white as Batman make things better at all? Or does he make decisions like these - distrust for Joker overriding the truth or value of his argument - and leave his sidekicks and family fearing for his future? For all those reasons and more, Batman fans won't want to miss Issue #4. Batman: White Knight #4 will be available January 3, 2018.